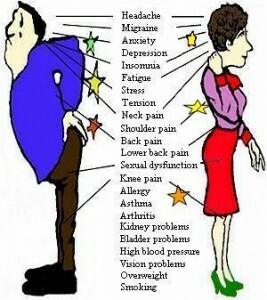 Most people experience significant pain at some time in their lives whether from injury, illness, or an unknown cause. Pain is a warning signal, an alarm that goes off when your body is trying to tell you that something is wrong and out of balance. Often, people suffering from pain try to cover it up, either by ignoring the pain or taking medication. However, treated in this way, the source of the pain will never completely go away. It’s like hitting the snooze button on an alarm. Unless the cause of the pain is treated, your body will keep sounding the alarm and reminding you that something is wrong. Eventually, the pain may get worse or become chronic. No one should have to live with pain. But what treatment is right for you? One approach is to get plenty of bed rest in hopes that the pain will just disappear. This may help for a while, but could possibly delay recovery and make the problem worse. Another choice is to take medication that dulls the pain for a short period of time. This is understandable when pain is constant and unbearable. It may be helpful, but it won’t get at the root of the problem and correct it. Also, many medications may cause unwanted side effects and further compromise your health. Acupuncture is a time-tested, safe, effective, natural and drug-free way to eliminate pain. Unlike other methods for handling pain, there are no side effects. The World Health Organization (WHO) and the National Institutes of Health (NIH) acknowledge the benefits of acupuncture in treating and eliminating pain due to a wide range of causes. Acupuncture practitioners recognize that there is a vital life energy, called Qi (pronounced “thee”), circulating within the body. Qi flows through a series of pathways called meridians. Meridians are like rivers within your body. Wherever a river flows, it brings with it water that provides nourishment and life to the land, plants and people around it. Likewise, meridians transport life-giving Qi that provides nourishment to every cell, tissue, muscle, organ and gland in the body. It is important for Qi to flow freely throughout the body. Think of water flowing through a garden hose. A blocked hose will not provide an adequate, supply of water to a plant. Eventually, the plant will be unable to thrive, grow and blossom. Similarly, a blockage in the flow of Qi anywhere in the body will inhibit the amount of nourishment that reaches our cells, tissues, muscles, organs and glands. Under normal circumstances, your body can easily return to good health and vitality. But if the disruption of Qi is prolonged or excessive, or if your body is in a weakened state, the flow of Qi becomes restricted and a variety of symptoms – including pain – may arise. By inserting fine, sterile needles at specific points, an acupuncturist is able to break up blockages that have hampered the smooth flow of Qi. Once this is done, Qi can travel freely throughout the body, promoting pain-free health, well- being and vitality. Not only can acupuncture treat signs and symptoms of pain and discomfort, it can also get to the root of the problem. When the initial cause of the pain is corrected, your body can begin to heal on deeper levels. Your acupuncturist may also suggest adjunct therapies to enhance treatment and speed healing. Massage, stretching, yoga, herbal supplements and dietary changes support acupuncture care.